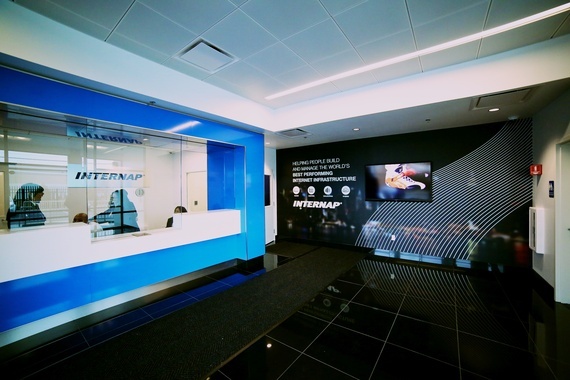 While Secaucus, New Jersey, prepared for the first "mass transit" Super Bowl in January, Internap quietly opened its newest data center a short ride from the train station. One of the most advanced modular data centers in the New York metro area, located in an industrial park outside the 500-year flood zone, holds strong appeal to organizations in the region, especially given the impact of Hurricane Sandy on lower Manhattan. In taking a tour of the new facility, this author was impressed in many ways. Internap has developed a template for building the next generation data center: efficient, secure and sustainable with a dual focus on customer satisfaction and revenue growth. The new Secaucus site is one of 16 Internap (Nasdaq: INAP) data centers, including 12 in the U.S. and four in Canada, in addition to facilities in Amsterdam, London and Singapore. It was specifically designed to meet the emerging demands of big data, mobility and the growing number of connected endpoints -- or, the Internet of Things -- with high-performance, scalable infrastructure that includes cloud, hosting, colocation and hybrid services. With the connected devices and sensors that will invade every facet of our lives, data as we know it today will be dwarfed by the information we store and access by 2020. This data will deliver everyday mundane details about our lives to us wherever we are -- from information about home heating and cooling, indoor air quality and security to food storage and expiration dates -- and will transform us in more efficient ways. Hybrid cloud data center companies like Internap and their competitors will play a central role in that transformation. In a conference call with Internap's team of Michael Higgins, Sr. Vice President of Data Center Services, Mandira Mehra, Sr. Vice President of Marketing, and Raj Dutt, Sr. Vice President of Technology, I got a full overview of Internap's core differentiators and what makes them tick as a business. Modular design is at the core of our new data center buildouts. It's something we have perfected. The key feature at the heart of the modular approach has been to match infrastructure with power density. Our design adds power, heating and cooling capacity as the loads move. Previously, we had to build our data center capacity based on anticipated customer demand and hope that the two aligned. Today, we have much more flexible infrastructure design capabilities that allow us to meet new customer power requirements as they materialize -- without the need to consume additional floor space. For example, we're able to load 50-watts per square foot up to 600-watts per square foot. The new Secaucus data center follows an Internap formula. The prototype data center for us has approximately 100,000 square feet of gross space with about 55,000 square feet of net-sellable space and tall clear heights, as well as high-density power capabilities and high-speed fiber in the ground. Why are clear heights important? With data centers now online 24/7 every day of the year, and racks of servers filling the floor space, the tall heights allow data centers to breathe by promoting air flow and enabling more efficient heating and cooling. During the tour, Internap also showed a steel sound barrier behind the facility where the air coolers are located. In the dead of winter, those noisy coolers weren't on. But as a good neighbor, and to "comply with the town of Secaucus and the Meadowlands Commission, which overruled Secaucus on dampening the decibels on the coolers for other tenants in the park and residents in the neighborhood, it's fairly common to build such barriers," Michael Higgins said. He added that the sound barrier was part of the original design. As part of building any new data center, Internap meets with the local power company to learn what municipal regulations are important since they're different in each region throughout the country and from other nations around the world. On day one, we sat down with the power company to learn what the substation requirements were so we could better plan our design. This building is one of the best assets in the area. It met all our requirements and was ready to 'plug and play,' with large galleries to customize to our specifications, plus the ability to house mechanical units behind walls with only customer racks out on the floor. The idea behind the last point is to keep maintenance workers separate from customers and away from where the data is stored. That's key to preventing mishaps and keeping information safe and secure. When the data center is fully built out, it will have 20-megawatt power capacity -- some of the highest anywhere in the industry today. At Secaucus, like many of our new data centers, we've also invested heavily in energy efficiency and sustainable design and operations. Features like in-row cooling, modular power design, and outdoor air economizers not only improve efficiencies at our facilities and reduce environmental impact, they're also appreciated by our customers, an increasing number of whom have internal sustainability initiatives." Our full suite of infrastructure and guaranteed performance levels. The message to our customers is to use the infrastructure that best fits their application needs. Whether that's virtual or bare-metal cloud, colocation, hosting, or a hybrid environment that combines multiple services, customers get seamless infrastructure management, consistently high performance, and cost-efficiencies with a single vendor. During the opening of the Secaucus data center, Internap showcased its hybrid capabilities through a customer panel featuring executives from eXelate, Outbrain and Shutterstock, who discussed using Internap's colocation and cloud solutions to build and manage globally distributed applications at scale. Internap's cloud and other infrastructure services in Secaucus -- and all of its data center locations -- leverage a patented route optimization technology that has its roots in the company's origins. Combined with the ability to utilize numerous carrier backbones in all major markets worldwide, Internap's technology makes more than 15 million routing calibrations every day to guarantee that customer traffic is delivered over the fastest Internet path with the lowest latency every time. The acquisition of Voxel in late 2011 strengthened our cloud offering with a mature, hybrid virtual and bare-metal public cloud platform that we've since integrated with our colocation and high-performance network. Our acquisition of iWeb in December 2013 added international scale, giving us the ability to leverage our global data center footprint to serve iWeb's base of SMB customers around the world. We're focused on enabling our customers to deliver cutting-edge applications and creating value for our shareholders through our transition from a colocation and network services provider to a high-performance Internet infrastructure provider. Our goal is to offer the most comprehensive hybrid infrastructure portfolio so that we can meet our customers' full range of needs, and we're seeing the results of this strategy with steadily increasing margins and the best profitability in the company's history. Within its hybrid portfolio, Internap's bare-metal public cloud service is playing a big role in the company's cloud success. By combining the performance of dedicated, single-tenant servers with the elasticity, self-service and pay-as-you go pricing associated with virtual public cloud, bare-metal cloud servers are gaining popularity with Internet-centric customers that need consistently high performance and cost-efficiency for distributed, large-scale application environments. What I came away with: all clouds are not created equal. As we enter the next phase of the cloud era, fueled by the data deluge and with many organizations now beginning their infrastructure journeys in the cloud, new demands are surfacing, and there are an increasing amount of cloud -- and other infrastructure -- options to meet these diverse and changing needs.